So I decided that it was hit time I introduced everyone to our second dog, Booge. It’s pronounced like Boo (like a ghost) with a “j” sound like in juice. My dad was firmly against us getting a third dog (we had Magic and Cyrus at the time) unless it was a Boston terrier named “Spike” or “Pug”. He’d grown up with Bostons with those two names rotating and wanted to continue the tradition. 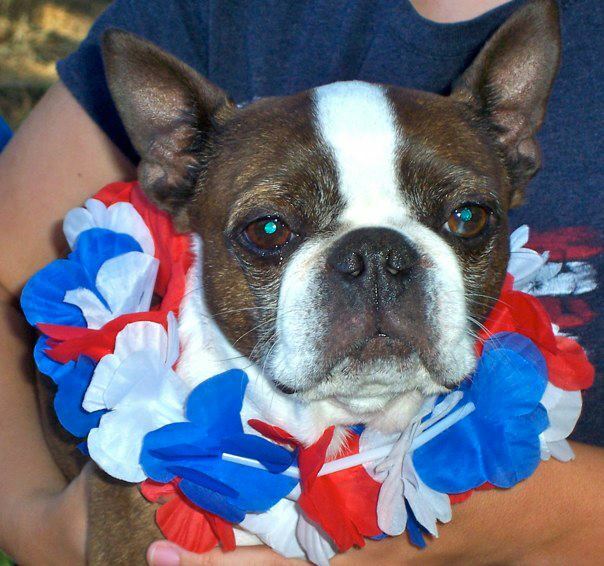 Booge celebrating 4th of July. 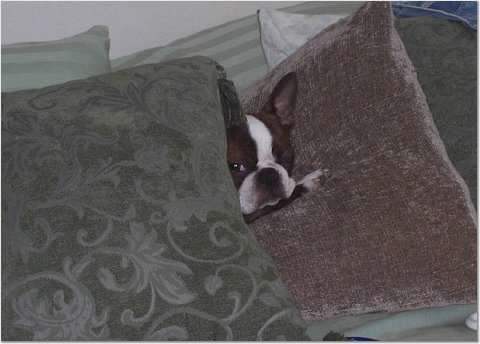 We agreed to getting a Boston Terrier, but refused both names because “Pug” is a breed of dog and just sounded dumb, and the last Spike had been such an awful dog that no one wanted his name to ever be brought up again (this is true, Spike was terrible). 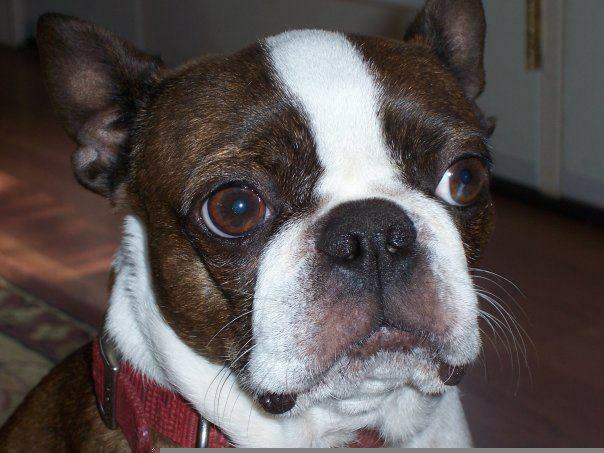 We decided on Booge because that is what my dad’s uncle called Bostons for some reason. Anyway Booge is not like our other dogs, or any dog I’ve known. He is only moderately affectionate, and doesn’t like playing or walks. He likes sleeping, and heating himself to extreme temperatures. Don’t get me wrong we all love him, he’s just not what we were expecting. His parents were friendly and playful and he just isn’t. He’s very well socialized, he went to work with my dad from the time he was a puppy until a little over a year ago (roughly 9 years). He also has his own Facebook page because, why not? Colleen has recently started him in a nose work class, again why not, and he’s actually impressed the instructor with his sniffer skills. I don’t find this surprising in the slightest because his food drive is so high he’ll stop at nothing to eat all the food that ever existed. Once he knows there’s a treat to be had he will do exactly what he needs to in order to get it. Oh he also snores like a freight train, not that this surprised any of us given how his face is shaped. But he uses it to his advantage, if we’re watching TV and he thinks that he’s not getting enough attention he’ll stare at you eyes wide open and snore at top volume. So that’s Booge in a nutshell. He’s less prone to antics than the other dogs because he considered himself above such nonsense (or something). I really enjoyed the parts about the dog’s tremendous nose skills and talents at sniffing out all foods that exist. Also the snoring of the dog. That’s too funny. Does the dog sleep on your bed? Do you need to wear earplugs to drown out the freight train sounds of the dog? It really is very funny. I don’t have a dog. I have a cat, or the cat has a human (me). She makes super loud meows, sometimes in the middle of the night. But… cats are bosses and humans are staff. My family also have two dogs. We have a japanese spitz his name is Grey. He’s very alert and smart. We also have a rottweiler, Bailey. Visitors are scared of him but he really is a big baby and he loves to be pet, plays a lot and sleeps a lot. Having dogs take a lot of responsibility but they’re worth the stress. Keba- Oh he is quite the character. Despite not seeming to care about people one way or the other he won’t rest until everyone around him wants to love on him. I’m quite sure that he spends quite a lot of time “sleeping” he’s very demanding when he wants attention. A book is in the early stages! Alice- He splits his nights between me and my sister, he’s in my room every night. I’m glad you enjoyed my post! Thanks for stopping by! Krysta- That’s so true! I love my dogs!